Among all the beacon deployments in the retail sector, Lord and Taylor’s has been much talked about. 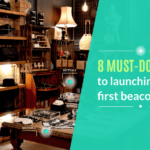 What makes their beacon deployment stand out is that they took a very planned and well thought-of approach to going live with beacons. Hudson’s Bay Company (HBC), that operates more than 130 Lord & Taylor and Hudson’s Bay department stores, began testing location-based coupon app called SnipSnap in the month of May 2014. The test involved sending “mystery” coupons to users, when they were within 500 meters of a store. Shoppers could learn the value of the deal by swiping their phone screen to get up to a 25% discount on merchandise. By end of July in the same year, HBC announced that they would be rolling out beacons across select U.S. and Canadian stores.The three month long, large-scale, beacon trial showed encouraging results. While engagement with push messages were as high as 50%, the ‘click-to-claim’ coupons saw 20% results. After these three months of trial, they decided to go mainstream with beacons – a large-scale beacon deployment across all of its U.S and Canadian stores. This full-blown adoption of iBeacon technology was well in time for the busiest shopping season of the year. The best thing about this deployment was that the brand made an effort to learn from their beacon trials. For example, while they had enabled 6 to 8 different experiences or campaigns per store during the trials, they now limit it to 3 per visit. What makes Lord and Taylor’s beacon deployment stand out? Another feature about their beacon campaign that was different from other campaigns was that the retailer launched their beacon campaign with third party apps, rather than their own app. This was done to increase their chances of reaching out to a wider audience, and acquiring new customers rather than targeting their own customers only. Though, this is a convenient way to try out beacons, to gain the most out of your beacon strategy it’s best to have your own beacon campaign. This gives you a chance to learn from your consumers’ behavior and use such insights to strengthen sales. The Regent street implementation of beacons is unique as it involves more than a 100 stores around a particular street rather than a specific brand or a group of brands. The key player in this deployment is the app. The Regent Street App makes a very different use of iBeacon technology with its ‘one-app-one-street premise’. What makes the Regent Street implementation of beacons unique? Beacons are installed along the street at participating stores, so when shoppers visit Regent Street they receive tailored content about everything from brand new in-store promotions, upcoming events, to exclusive ‘offers of the day’. Shoppers can thus receive deals and offers in real time as they walk down the 130 stores on the “Mile of Style” (as Regent Street is also known as). The best thing about the Regent Street beacon implementation is that shoppers can create their own profile using the app. They can also log categories of interest, including brands and products, within the app itself. Building a specific profile for each shopper is extremely helpful, as it allows users to receive content tailored to their individual preferences. Users can indicate brand affinity by swiping up or down on a series of 40 some flashcards, each of which represents well-known brands. A key benefit of the new app for shoppers is the ability to input their store preferences whilst still maintaining their anonymity. This one of a kind beacon deployment reiterates the fact that beacons present businesses with myriad opportunities, one just needs to capitalise on them. Popular drug retail chain Duane Reade’s iBeacon trial at 10 out of its 240 New York stores was a great attempt to foster customer engagement. In addition to the value that an iBeacon program brings to customers, it also offers Duane Reade substantial benefits: the company hopes that tracking user movement in stores and tying it to purchase history will reveal new insights into customer activity and preferences. These were the most impressive retail beacon deployments in my opinion. Are there any more that you can think of? Let us know in the comments below.